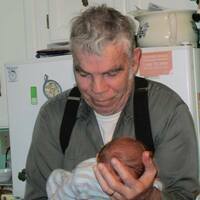 Provide comfort for the family of Peter Landry with a meaningful gesture of sympathy. Funeral services and interment will be held in the spring to be announced. One day coming home from a visit to the dentist Uncle Pete stopped in CMCO Publications like he did frequently. He had something to bring over. I happened to be the only one around right then. He began telling me all about what needed to be done with his teeth. It was looking very big to him and he mentioned how costly it would be. Then he sort of mentioned how if nothing gets done with his has bad teeth it could eventually affect his health further. He was thinking that he should just die, no one would miss him anyway. I reminded him of a message we had just heard at church about our thoughts just the evening or so before and also assured him that there would be a lot of people that would miss him. He thought about that some and then agreed with me that that would likely be the case. Then he also mentioned you know that is why I love you all so much. It was special every time he came for a visit at our place as well. We have many fond memories but we are thankful that all his suffering is over and he is at peace and at home with God, his Father. May you as family find comfort in all the good memories you have of Uncle Pete.